Word of mouth! I heard great things about ManTech from friends and colleagues and wanted to experience the company culture firsthand. After college, I spent a few months as a substitute teacher. This taught me leadership skills and how to be calm and composed (even when you overhear something really funny and you want to laugh). With a short commute! Wouldn’t trade it for the world. If you’re entry-level like I was, don’t be intimidated when you interview – be yourself. 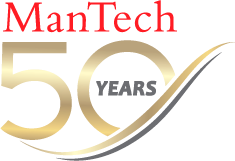 ManTech is diverse and dynamic, so hiring managers want to see that you would be a good fit for the team. Empathy, open-mindedness and putting pineapple on pizza. What is the coolest thing about what you’re working on now? Having the opportunity to engage with many different departments. ManTech is a large company and I appreciate the ability to collaborate with employees whose areas of expertise are so varied from my own. My dog. I want to experience her level of comfort, even for just one day. Emma Coburn, the first American woman to win an Olympic medal in the 3,000-meter steeplechase. I ran steeplechase in college and have always admired her dedication and drive.